Courtesy of The Philippine Women Centre of B.C. Jocelyn Vergabera’s high cheekbones swell as her lips pull back in a disarming smile. She’s preparing coffee for some of her regulars as they chat to her in Arabic, one of the five languages she’s picked up throughout her life. Vergabera says her job at Tim Hortons is a big improvement from the years she spent working as a live-in caregiver in Shaughnessy. But while the twinkle in her eye is a sign of her vitality and friendliness, it also masks the torment of a long road towards a better life – one which is far from over. Vergabera hasn’t seen her children in seven years, except via webcam, and she is worried that she won’t recognize them. “I want to touch them, I want to hug them, I want to make up all that time that I haven’t given them. I have looked after other children; I have kissed and hugged other people’s children but not my own. I have become mentally and physically old; the stress of separation is torturing me,” she told the Vancouver Media Co-op. 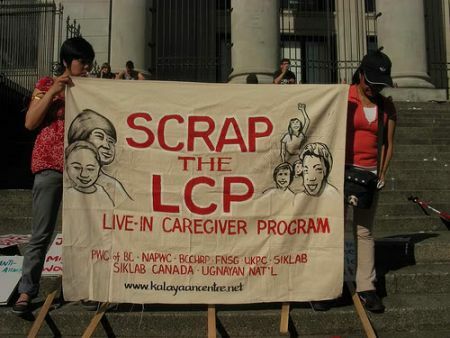 Vergabera’s situation is common for Filipino women coming to Canada under the Live-In Caregiver Program (LCP). The LCP, officially established in 1992, issues a temporary work visa valid for up to four years to qualifying applicants, who are expected to board in their employer’s home while working as a live-in caregiver for children, disabled or aging persons. In 2005, Filipino women accounted for 95.6% of the live-in caregivers in Canada. In 2006, 21, 489 workers held a work permit under the LCP program. The way Canada’s LCP appears on paper appeals to Filipino migrant workers: it provides for defined working hours (eight hours per day), a good salary (minimum wage), and most importantly, the opportunity to become a landed immigrant after completing two years of work. But the reality for many of the Filipino women who enter under the LCP includes hours of unpaid overtime, living in constant fear of their employer, and facing years of separation from their own family while they wait for their immigration papers to be processed. The federal government underwent a review of the LCP in 2008-2009 and made some changes. As of April 2010, the amount of time participants have to complete the required 24 months of full-time work as a live-in caregiver increased from three years to four, participants can use over-time hours to complete the program in as early as 22 months, and the second medical exam required to apply for permanent residency has been eliminated. As well, employers are now required to include things like working hours and wage in their employee contract, they are responsible for paying for their employee’s processing fees and airfare to Canada as well as for providing private medical insurance until their employee’s provincial coverage is activated. In April 2011, the government will implement a more rigorous assessment of an employer’s genuine job offer as well as introduce a two year ban from the program for abusive employers. Advocates at the Philippine Women Centre (PWC) say these changes will not stop the exploitation and are calling on the federal government to scrap the LCP all together, saying it’s a blemish on Canada’s human rights record that promotes a cycle of poverty for Filipino migrant workers. The live-in requirement is one of the conditions of the program that really makes these women vulnerable to exploitation, says Charlene Sayo, who is the executive director of the Philippine Women Centre of B.C. Academic publications showing that the live-in requirement undermines caregivers’ capacity to protect against unfair work conditions abound, as do testimonies of women who have suffered the consequences. Vergabera has a good understanding of why Canadians might find this type of work undesirable. Her story as a live-in domestic worker started in 1994. Desperate to escape an abusive husband and support her three children, Vergabera left her home in the Philippines to work abroad. She first went to Saudi Arabia as a live-in domestic worker where she was never allowed to leave the house and was paid $150 per month. After four years she was homesick, and returned to the Philippines desperate to see her children. “I didn’t even recognize them,” says Vergabera, her eyes tearing at the memory. However, as much as she wanted to stay with her children she soon realized that the reasons she left had not changed. Ten months later she went to Taiwan, a more liberal country with a much higher salary. She worked two jobs, was on-call 24/7, and never had a day off, but with a monthly salary of $900 she was able to care for her own children as well as pay for all of her siblings to go to college. Then one fateful day in Taipei, Vergabera met a fellow Filipino migrant worker who told her about her plans to emigrate to Canada. She said that in Canada you only had to work eight hours per day, the salary was $1400 a month, and after two years you could become a landed immigrant. “Hearing that sounded like cake, like you won a jackpot, and imagine it’s Canada,” recalls Vergabera about the idea of reuniting her family in a rich country that would provide them with the opportunity for a better life. Using all of her savings, Vergabera paid the $3500 processing fee to a Filipino-based agent to handle her paperwork. This money exchange is one of the reasons the Canadian government is not motivated to eliminate the LCP, says Sayo, despite the documented systemic exploitation it creates. Through the LCP, the government is attempting to solve the childcare crisis in the private sector instead of investing in universal child and elderly care; something that would benefit all Canadians, instead of just those who can afford a live-in caregiver. Not only do these women pay agency and application fees to come to Canada, they’re often well educated and equipped with skills Canada didn’t invest in. When Vergabera arrived in Canada she was disappointed to discover that after room, board and taxes where deducted, her take-home pay was only $900. Worse yet, when she described her living circumstances, they were not that different from Saudi Arabia. Her employer was an affluent family in Shaughnessy who forced her to work unpaid overtime, forbid her from having a TV in her room and rarely let her leave the house which they kept under alarm. After so many years of sacrifice, she wasn’t willing to jeopardize her chance to reunite her family in Canada by standing up for her rights. The employer-specific work permit issued under the LCP is another condition that makes these women vulnerable to exploitation. If an employee wants to seek a new employer, she has to apply for a new work permit, which can take many months to process. She often doesn’t have savings to tide her over while she waits because all her money was sent back to the Philippines to support her family. This also eats into her four year time limit to complete the 24 months work as a live-in caregiver, and it just extends the time she’s separated from her family. For this reason the PWC is also advocating that in the short-term, the LCP reform its employer specific work permit to an open one, as well as grant landed status upon arrival. “Give them a fair start in Canada, don’t let them come in on losing ground, these women are already vulnerable to begin with,” says Sayo. With the dream of reuniting her family, Vergabera bit her tongue and persevered with her employer. In 2008, she completed the mandatory two years work as a live-in caregiver and applied to become a landed immigrant. She has been waiting since. According to Citizenship and Immigration Canada, the normal processing time is 16 months. But flying in the face of official ministry numbers, Vergabera says she has peers who’ve waited up to 10 years to be processed. And while Vergabera’s dream of family reunification is shared by many women in the LCP, Dr. Geraldine Pratt, a professor at the University of British Columbia cautions that it can be a difficult process. Pratt’s research found that for women in the LCP it takes five to six years to bring their families to Canada and the median age of the children is 13. Re-establishing relationships after years of separation is complicated, especially when a family is struggling to survive and the children are trying to adapt to a new culture. This stress is reflected in a high drop-out rate for Filipino children, which Dr. Pratt says is a worrying for a community that highly values education. When they arrive in Canada, Filipinos are often well educated but systemic discrimination keeps them one of the poorest immigrant communities. “The Filipino community has the highest educational level of any immigrant group, and what we may see is a radical downward educational and social mobility,” Pratt told the Vancouver Media Co-op. This is compounded by the fact that the LCP deskills its participants. About eighty percent of Filipino women in the LCP have post secondary education; many are trained as registered nurses, midwifes and teachers. But most end up trapped in a cycle of survival and never manage to exit entry level jobs in the service or health sectors. Since completing her work requirement for the LCP, Vergabera has found a new job at Tim Hortons. Even though she’s still struggling, she’s much happier now that her rights in the workplace are respected and she no longer has to live in fear of her employer. In the meantime, Vergabera is anxiously waiting for the day she can hug her children again, which she hopes will be next year. They are adults now, and she’s warned them that living in Canada can be a tough experience. Despite their professional degrees she knows that they’ll probably also be serving coffee, fighting to survive. But at least they’ll be fighting together. This story is the Vancouver Media Co-op's first paid feature. Each month, we pay a contributor to investigate an issue in depth. If you would like more information on pitching a story to the VMC, please click here. According to statistics from surveys done by the Association of Caregiver and Nanny Agencies Canada (ACNA) there is a 70 to 90% drop in placements following changes to the Live-in Caregiver program by the Government of Canada. Fewer and fewer caregivers are coming to Canada. Recent changes to Immigration Canada’s Foreign Live-in Caregiver Program (LCP) have increased the burden on Canadian families through high costs and increased risks associated with hiring an overseas caregiver. The “Balanced improvements” have produced a significant decrease in the number of families using the program. At the current rate there will be no more LCP with fewer and fewer caregivers coming to Canada. Without Employers there is no program. The Government should realize this. If Caregivers had done there due diligence and gone through a reputable agency problems with employers would not happen as the agency would intercede on the the Caregivers' part and sort out problems or place the caregiver in another home ensuring the previous employer is blacklisted with the Provincial Government. That is what our agency has done over the past 20 years. Below is a letter from an employer who is disgusted with the changes. families to hire suitable childcare or in-home care for adults. residence on the commencement of two full years employment in Canada. incurred by either the family or the caregiver. eventually had to let go of early. wait another 8 months for a replacement nanny. make other childcare arrangements, should she too not work out. Conservative party would put Canadian families in such a position. You have definitely lost my vote after voting conservative all my life." I really enjoyed the read. Thanks for the research and writing!